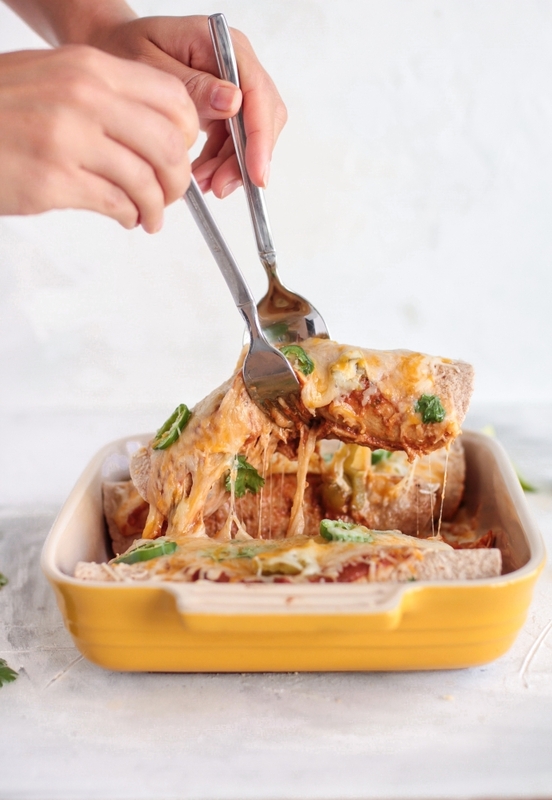 If there is one food item we tend to discuss quite frequently in these blogs, it’s chicken enchiladas. There are so many different ways to prepare them that you’re bound to find a twist that works best for you. You may just like the one being discussed today which will serve up to four people. Begin by heating a pair of tablespoons of oil in a medium saucepan using medium-high heat. Once it’s shimmering, add the onion and cook it until it becomes soft. The process should take about five minutes or so. Follow by stirring in the salt, garlic, sugar, chili powder, cumin, and coriander and cook until the mixture becomes fragrant, about thirty seconds. Stir the chicken in and coat it sufficiently with spices before stirring in the water and tomato sauce, allowing it to simmer. Continue to cook until the chicken is cooked through, which should take about eight minutes. Use a fine-mesh strainer to strain the mixture into a bowl, making sure to press the onion and chicken to extract the maximum possible. Move the chicken mixture over to a bowl and allow it to refrigerate for about twenty minutes until it becomes chilled. Follow by stirring in two and a half cups of cheese, the cilantro, and the jalapeños. Move your oven rack to the middle position and heat the oven to 450 degrees. Spread ¾ cups of the sauce on the bottom of a baking dish measuring 13×9 inches. Use the last pair of tablespoons of oil to brush each of the tortillas on both sides before stacking them and wrapping them in a damp dish towel and setting them down on a plate. Place them in a microwave for about a minute until they become pliable and warm. Use a 1/3 cup of chicken filling on the center of each tortilla before rolling it up tightly around the filling and placing it seam side down in the baking dish. You may wish to arrange the tortillas/enchiladas in a pair of columns across the baking dish width. Use any of the sauce you have left to pour across before sprinkling with another half cup of cheese. Tightly cover the dish with greased up aluminum foil and bake until the enchiladas are properly heated through and the cheese has melted. This step should take about fifteen minutes.